Brady Quinn still hasn't gotten over the tragic events of last December, and suspects he never truly will come to grips with what happened. Even when he tries to push away the memories, they creep back, often when he least expects it. Investigators believe alcohol, and stress in the relationship between Jovan Belcher and his girlfriend, Kasandra Perkins, played roles in Belcher killing Perkins and then himself, a Kansas City, Mo., police source said Tuesday. Jovan Belcher was out partying and drinking the night before he killed his girlfriend and shot himself in the head, a law enforcement source with knowledge of the investigation said Monday. 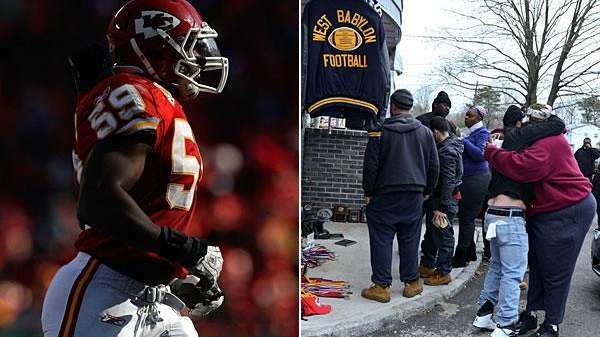 The Chiefs' game against the Carolina Panthers went on as scheduled Sunday, a day after the murder-suicide involving Chiefs linebacker and former West Babylon star Jovan Belcher. Ryan Lilja's eyes welled as he recalled the emotions in the Chiefs' locker room moments after Sunday's victory.